22 Practically Immortal Houseplants That Even You Can’t Kill! If you adore pops of greenery in your home, yet are plagued with a case of the dreaded black thumb, don’t despair. There are ways around this terrible condition! 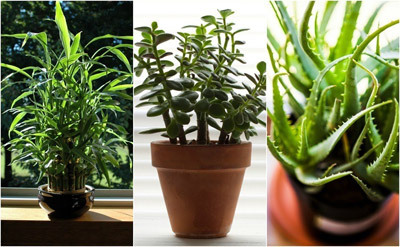 Thanks to these 22 practically immortal houseplants, you too can enjoy cleaner indoor air, and the sense of relaxation and peacefulness that plants bring to the home. Known as the ‘plant of immortality’ by the Egyptians, Aloe is an incredible medicinal plant to have on hand. Use its gel as a topical treatment for minor cuts and burns, insect bites, dry skin and more. It’s also one of the top 12 plants to promote a restful slumber. Simply leave your potted Aloe plant near a window that gets a lot of sun. As a semi-tropical succulent, it tolerates neglect well and only requires infrequent watering. One of the most popular indoor houseplants, the Areca Palm can reach up to 8 feet tall. Keep your tropical tree in bright indirect light, warm temperatures and water infrequently. Don’t worry, this plant will let you know if it’s thirsty – its fronds will wilt. Once you rehydrate it, they’ll perk right back up again! Once you see the leaves of this pretty plant, you’ll understand where it got its name! Leaf colors vary from dark green to a pattern of light and dark shades. You can prune your Arrowhead so that it retains a bush-shape, or allow it to grow wild and free, when it will form a trailing vine. The Arrowhead Vine is happy in indirect light, although it won’t tolerate temperatures below 60 degrees. Allow it to dry out between waterings. One of the most popular varieties of fern with frilly leaves and long, hanging fronds, the Boston Fern is native to sub-tropical and tropical rain forests. Mimic these growing conditions by placing your fern on a windowsill which receives lots of indirect light, and in temperatures of between 55 and 75 degrees. It likes humidity, so a kitchen or bathroom are good locations for your Boston Fern. In warmer months, and when new fronds appear, keep the soil evenly moist, but not saturated. In the winter, let the soil’s surface dry slightly before watering. Bromeliads make great indoor plants for those who aren’t gifted in the garden. They have few needs and aren’t susceptible to many pests. With brightly colored foliage, they withstand drought well (although they will rot if over-watered) and, just like the Boston Fern, need high humidity. They thrive in bright, sunny spaces with indirect sunlight, and should be fertilized quite sparingly. Growing cacti and other succulents is an incredibly rewarding hobby – mainly because these tough, juicy plants are next to impossible to kill. It’s unsurprising really, given that they thrive in the desert! Place your cactus or succulent on the windowsill or in the sunniest spot in your home, and neglect them in terms of watering – quenching their thirst only when the soil becomes very dry. This plant lives up to its name – it’s an incredibly tough houseplant which thrives on neglect. The Cast Iron Plant can survive low light, infrequent watering and extreme heat. Just place your potted plant in low to moderate light (keeping out of direct sunlight); and water it thoroughly, allowing it to dry out in between. If the leaves turn yellow, stop being so generous with the h2o! This plant is happy in average humidity and in temperatures from 50 to 85 degrees. Described as an 'almost foolproof' houseplant, the Chinese Evergreen is great for beginner gardeners. Its green leaves are usually streaked with silver, white or yellow and it grows to an average of just two feet. These houseplants do best in a north facing window but can manage in other locations as long as they are kept out of direct sunlight. They can tolerate low humidity, but like evenly moist soil. Keep away from pets. Native to Madagascar, this plant thrives in most homes as it adapts well to normal room temperatures and humidity levels. Its densely spiny stems support small red, pink or white flowers. Place the Crown Of Thorns plant in a very sunny window where it will receive three to four hours of direct sunlight daily. Once the soil is dry, make sure to water it. Note that, although cute and hardy, this plant is poisonous if eaten and the sap causes skin irritations so gloves are a must. It’s not for pet owners as it is poisonous to our four legged friends. With leaves that can grow to a foot long, the entire Diffenbachia plant can grow to six feet high – lending a tropical and summer feel to the home. Providing basic care to the Diffenbachia is easy – it does well indoors, and thrives year round in average room temperatures, although it prefers they stay above 60 degrees F! Keep it in a brightly lit room but out of direct sunlight. It likes humidity and moist (but not wet) soil. During the winter season watering should be reduced. Dracaena plants are commonly used to add a touch of greenery to offices, malls and apartment blocks thanks to their pleasant appearance and ability to purify the air. With over 40 species, there is sure to be a dracaena that takes your fancy! This undemanding plant tolerates low light, low humidity and even the occasional missed watering. Place it in indirect sunlight (if the leaves turn brown it’s getting too much) and keep the soil moist but not wet. Listed as one of NASA’s top plants for purifying the air, English Ivy has been shown in studies to improve symptoms of allergies and asthma; as well as removing feces and mold from the surrounding air. It looks beautiful and elegant when placed on a ledge or in a hanging basket where the leaves can trail down. This evergreen vine only needs moderate exposure to sunlight, although it does have a preference for moist soil and cooler room temperatures. Be aware that English Ivy is toxic to pets. A beautifully eye-catching indoor tree with large, dark leaves, the Fiddle Leaf Fig looks like a lot more work than it actually is. A couple of these in your home will have everyone believing you’re an expert gardener! The Fiddle Leaf Fig likes bright, indirect light, and temperatures between 65 and 75 degrees. Water only when the top inch of soil is dry. The Golden Pothos boasts beautiful marbled, heart-shaped leaves and is another fantastic air-purifier. It requires little in the way of nurturing – a couple of hours of morning sun and a little water once a week will see it thrive. In order to stop it getting out of control, and to keep its mildly toxic leaves away from pets and little ones, keep it in a hanging basket. This glossy-leafed vine is best positioned in a hanging basket to show off its trailing foliage. It likes moderate to bright light, although not direct sun. Water the Grape Ivy generously throughout the growing season, keeping the soil evenly moist. In winter, allow it to dry out between waterings. If the leaves turn brown, check that the plant is out of direct sunlight and the humidity isn’t too low. Taking care of a Jade Plant is easy – and they are considered to be symbols of good luck. In order to keep its thick leaves hydrated and lush, you’ll need to water regularly. While you shouldn’t let a Jade Plant dry out completely, over-watering will cause root rot. A good rule of thumb is to water when the top of the soil is just dry to the touch. Aside from that, all a Jade Plant requires is full sun and fertilizer twice a year. Plant care doesn’t get much easier! Members of this family make for highly decorative houseplants and offer a variety of leaf sizes, shapes, colors and textures. While they can tolerate poor light, they thrive in brightness, but not direct summer sunlight. Water your Peperomia only when the soil is quite dry. There are many variations of this tropical-looking indoor plant, although the split-leaf is probably the most popular. Regardless of which variety you choose, you can rest assured that they ask little in the way of care. And, if you keep an eye on them, the Philodendron will let you know what it needs. Place the plant in bright, indirect sunlight. Yellow leaves may indicate it needs more shade. If the stems have too much space between the leaves, then it should be moved to a brighter position. Allow the top inch of soil to dry out between waterings. Drooping leaves indicate its watering schedule needs to be adjusted. With dark, glossy and leathery leaves which can grow up to eight inches long, the Rubber Tree is another hardy yet impressive piece of household greenery. Few things bother this plant as it thrives in household temperatures and humidity. Keep it in bright light, with no direct sun, and ensure the soil is kept evenly moist. If the leaves turn yellow, you may be watering it too often. Also known as Mother-in-Law’s Tongue, the Snake Plant grows upright, and often has yellow or white edged leaves with white flowers that rarely bloom. It emits oxygen at night time whilst simultaneously taking in carbon dioxide – making for better air quality and healthier sleeping patterns. This hardy plant can survive low light levels and drought and isn’t prone to insect infestations – possibly the best plant for those lacking a green thumb! Simply sit your Snake Plant in indirect sunlight and allow it to dry out between waterings. This interesting plant is commonly found in all manner of waiting rooms and public spaces – and with good reason. Not only does it remove odors, fumes and around 90% of formaldehyde from the air (a chemical found in common household products like adhesives, grout and fillers) but it’s incredibly low maintenance. Spider Plants prefer evenly moist soil and bright or medium lighting in temperatures of between 40 and 85 degrees F.
Also called the Eternity Plant, the ZZ can handle a fair amount of neglect and isn’t susceptible to any pests. Its oval-shaped, glossy leaves also fit in well in any home.